Concerned Americans are turning toward using the over 6,000 products labeled sugar-free or “diet” believing it is a healthy alternative. Artificial Sweeteners are alternatives to table sugar (sucrose), and high fructose corn syrup (HFCS) but studies are find out the truth. It has since been discovered that aspartame and other artificial sweeteners cause damage to your health. See article by Dr. Mercola. SteviaThe Safe and Natural Sweetener. Stevia Extract is a sweetener extracted from the Stevia Plant. Today, Stevia is cultivated in over a dozen countries worldwide. It is a major export product and is widely used in countries such as China, Brazil, North and South Korea, Taiwan, Israel, Paraguay and Malaysia. Stevia has also been grown successfully in California, southern Ontario, Canada and even southern England. Although there are several different species of Stevia, the most potent and effective seems to be Stevia rebaudiana,and this species is used in most dietary supplements on the market today. 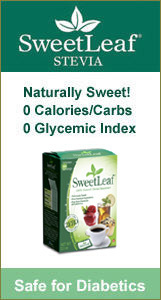 SweetLeaf Sweetener® goes by the following names: Whole Leaf Steviol glycosides with rebaudioside A and stevioside are granted Generally Recognized As Safe (GRAS) status by the FDA. 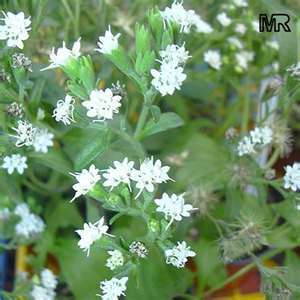 Stevia’s properties name is steviosides, Species of plant = Stevia Rebaudiana, Type of Plant = Eupatonium, Plant Name = Stevia, Other names used = Rebudianum, Sweet Leaf. In 1887, Antonio Bertoni, a South American scientist, observed Indians of the Guarani tribe of Paraguay who used Stevia to flavor bitter tribal beverages. Bertoni erroneously classified Stevia as a member of the daisy family, but it was later re-assigned to the chrysanthemum family in 1905. 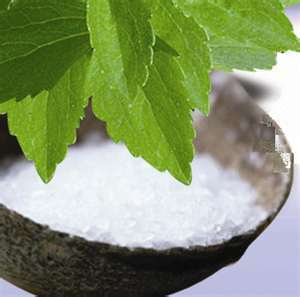 Twenty-five years later, two French chemists conducting research on Stevia isolated the primary constituents responsible for Stevia’s properties and named them steviosides. There has never been a complaint that Stevia, in any of its consumable forms, has caused any harmful side effects in the 1500 years of first use in Paraguay then the 1200 years in the rest of South America, and about 20 years in Japan. Scientists who have studied Stevia, state that it is safe for human consumption. Stevia has been approved as a food additive in 12 countries, including Japan, Brazil and China. Now comes the confusion; what Product do you buy? Both products use rebiana, and is called erythritol, an extract of only certain ingredients from the stevia plant, not the whole plant as available as a natural sweetener for more than 1,500 years and as available from SweetLeaf or other supplement companies. Exactly, What is the New Sweetener Erythritol? If you look at the ingredients of VitaminWater 10 (owned by Coca Cola), you might be pleased to see that it contains the natural sweetener stevia. However, you will also notice that it is loaded with crystalline fructose, sucrose, and a mysterious product called Erythritol. Erythritol is a sugar alcohol, a sweetener that does not provide as many calories as sugar. But the reason that sugar alcohols provide fewer calories than sugar is because they are not completely absorbed into your body. For this reason, high intakes of foods containing sugar alcohols can lead to abdominal gas and diarrhea. 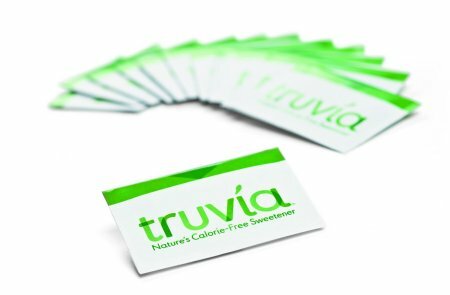 Currently on the market are two “Stevia” sugar substitutes one using only part of the plant and The Natural Stevia from the complete leaf. Everyone else, the FDA has said, can import Stevia , labeled and sell it as a dietary supplement and in skin Care only. Below is a small sample from the many companies that provide a variety of supplements of the product. 1/3 to 1/2 tsp. 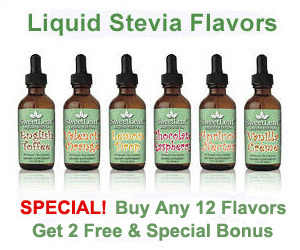 Stevia Extract Powder = 1 cup of sugar! This product is extremely sweet, with no bitter aftertaste when used sparingly. Stevia Extract is heat stable and is safe for diabetics and hypoglycemics. It’s gonna be a while before you run out. Cookbooks featuring hundreds of Stevia Extract recipes are also available. I use 100% Stevia on just about everything I want sweetened. It works for me! I use Stevia also. I have several forms of Stevia, powder, pill form, and liquid. When I drink just plain water I even use just a small drop of Stevia for the whole gal of water and the taste comes thru makes the water taste better than just plain water. It is great as long as it is made from the whole plant. I use Stevia for all my sweetener needs. It was one of my first finding of good natural food. I don’t believe that the way way stevia is used now is the same way it has been used in the past It is not the ground up green leaf anymore, and is now way more processed and unnatural. It has been implicated as causing ovarian cysts. Thank you for the comment. I have written another post on Stevia where I show the ground green leaf product is still available. To my knowledge Stevia is in the same form that James May introduced it to the US Market. I do not know what form it was in before May. I do know the green leaf ground form is not near as sweet as the processed form. I am not aware of ANY SIDE/EFFECTS of Stevia ever being reported. Ovarian cysts is an indication of low thyroid and high sugar. It is an indication of a low immune system. Stevia does not effect the immune system like sugar. I have looked at the label of Stevia raw, as I remember it isn’t Stevia. That is why I stay with the label Sweet Leaf. Thanks for the comment. « And What do you do with Coconut Oil?